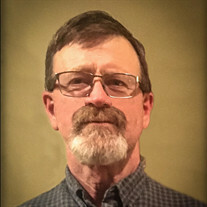 Bryan Stanley Stroh, 62 years old, was a resident of Newcastle, Wyoming. He went on to his heavenly home on June 12, 2018 after a long fight with cancer. He was a life-long rancher carrying on the family business of raising cattle. Bryan was the third of four sons, born to Donald and Evelyn Stroh on March 17, 1956. A resident of Kiowa, Colorado, he graduated from Kiowa High School in 1975, then attended DIT where he studied in auto mechanics. In 1977 he married the love of his life, Kathleen Arterburn, in Elizabeth, Colorado. Together they had four wonderful children and built their first home in Kiowa where they ranched until 1997. From there they moved to Newcastle, Wyoming. Bryan had a passion for cattle and worked hard to build a quality herd of Angus cattle. However, his greater passion was for Christ. Bryan had a servant's heart and served as deacon, elder, and worship leader in each of his home churches. He loved singing and music. With guitar in hand he gave his all to facilitating others in worship, and those around him couldn't help but join in. His zeal for God was contagious. His personable nature drew others to him almost instantaneously. Bryan was preceded in death by his parents. He is survived by his wife, Kathi, son Andy Stroh of Scottsbluff, NE; daughter, Mindy Auch of Newcastle, WY; son, Matt Stroh of Newcastle, WY; son Carl/Joe Stroh of Sugar Grove, NC; daughters-in-law, Leia, Rebekah, Melissa, and Andrea; son-in-law, Josh; and 18 grandchildren; his brothers William (Cindy) Stroh, Robert (Kim) Stroh, Bret (Jacque) Stroh; and numerous nephews, nieces, family and friends. Services will be held at Weston County Senior Center: 627 Pine St. Newcastle, WY 82701, on June 18th at 2:00 P.M. A private family burial will take place at the Stroh ranch. Contributions may be made to Yellowstone Boys and Girls Ranch or Kids Alive International.